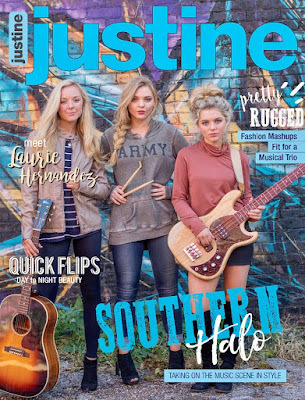 Country/Pop trio Southern Halo is featured in an eight-page fashion photo spread dubbed "Pretty Rugged" in Justine Magazine's current issue. Shot by Lindsey Lissau at American Dream Safari's Indoor Trailer Park in Memphis, Tennessee, hair stylist Jeniffer Ericksen and makeup artist Gypsy Nix mixed sweet and delicate looks with edgier clothing choices to create the perfect combo of rugged and ready-to-wear anywhere looks for these Mississippi sweethearts. The Morris sisters all share glorious blond tresses, mile-long legs and joyous attitudes - and, as Justine highlights, the girls' energy and musical talents combine for a unique sound that stays true to the Country genre while incorporating some far-flung musical influences. It's a mix that's working for Southern Halo - and it's taken them to a level of fame they never expected to reach in such a short span of time. Southern Halo is also included in the current issue's "Sister Act" profile, which features trending musical siblings Chloe X Halle (opened for Beyonce's Formation World Tour), Lennon & Maisy (Nashville), Haim, The Church Sisters, Lily & Madeleine and Niki & Gabi. "For us to share this feature with such well-known acts is phenomenally flattering," notes Natalia, Southern Halo's lead vocalist. "We're thrilled that the layout captures our 'work hard/play hard' philosophy." Southern Halo might be the hardest-working band around. The trio just returned home from a busy week in Nashville at Country Radio Seminar 2017 where they videotaped PSAs for Children's Miracle Network, sang the "National Anthem" for Operation Troop Aid, performed for radio programmers at the Grassroots Suite, and enjoyed interviews with dozens of media outlets. Next up is their U.K. performance debut with March dates set for London, Nottingham, Manchester, Glasgow and Newcastle. The tour is in support of their infectious current single, "Living Like That." The SOUTHERN HALO CD is available for purchase on iTunes and Amazon. "Living Like That" is available to radio via Play MPE; fans can purchase the single via Spotify.